Who knew spinach could taste so good? This quick and easy sauteed spinach recipe is a delicious low calorie side to any main dish and is ready in 15 minutes! Even with all the lip service given by Popeye, let’s face it, spinach has had a bad rep for a while now. It can be slimy and weird when done wrong and I’m sure we all have had bad sauteed spinach at one time or another. Well, fear not spinach haters – better spinach is on the way! This sauteed spinach recipe is easy peasy. It can be done in 15 minutes and goes well as a side to all kinds of main dishes. Fish, chicken, other veggie entrées, whatever really. Aside from being delicious, easy, and packed with vitamins, this sauteed spinach recipe has under 90 calories per serving. You heard me right, its that light. I love having reliable, low calorie, diet friendly veggie side dishes that I can turn to when I’m in a rush. this spinach fits that bill to a T.
I heated up the leftovers, added a piece of toast, and flopped a poached egg on top for breakfast and it was perfect. Like a healthy veggie-benedict but ready in 5 minutes and with so much good flavor. If you have any leftovers, I highly recommend doing this. If spice scares you, you can leave those red pepper flakes off without doing any damage. I leave them out whenever I’m either not craving spice or if it just won’t go well with whatever else I’m serving. It will taste just as good either way. Even though it ends up wilted, its best to use fresh, crisp baby spinach. That being said, I’m a repeat offender of buying waaay too many veggies on my weekly grocery shop run. Then I end up in a crunch, trying to figure out how to use them all up before they go bad. This is a great way to put that spinach that never made its way into smoothies or juice to good use, for those of you who struggle with the same healthy eating fantasies that I do. I start the week out with all kinds of plans, but by the time Wednesday rolls around, I normally know if those smoothie ambitions are going to become reality or not. At that point, the spinach has gotta go or it risks slowly sliming into nastiness. This is the point where you pull out this recipe. To highlight how easy it is, I’ve broken it into a three step picture process. 2. Add spinach and cook down. 3. Add lemon and red pepper flakes and you’re done! I’m planning on making sauteed spinach again this week actually and pairing with my husband’s pesto halibut recipe (which I swear I’ll share soon!). Yum. I served it with salmon a few weeks ago and it paired wonderfully too. This sautéed spinach would be a quick and easy addition to winter holiday meals as well since it pairs so seamlessly with other sides. In other non/semi spinach related business, I am a space cadet and totally missed the fact that the taquitos I posted last week were my 100th recipe! Woohoo! It took me a year and a half to get here, but as of last Saturday, Feasting Not Fasting officially has 100 posts. Its crazy to think back to when I first started this blog and how much I’ve learned since then. I still have lots to learn with photography, recipe development, and all things blogging related but have come so far since those first few posts. To put it in perspective, check out how bad this veggie side dish post is. The brussels were delicious, but the pictures don’t do it justice. It takes more practice than I ever could have imagined to make food look as good as it tastes and document the recipe well enough that it can be replicated. Now that I have more time on my hands (although its filling up quickly! ), I’m planning on going back through those old recipes and remaking them to update the photos and make sure the recipes work as written. I’ll update you all here and there when I come across recipes that are too good not to re-share. Well, thanks for sticking with me for the last 100 recipes (or however long you’ve been following). Here’s to another 100 meals and snacks from my table to yours! Who knew spinach could taste so good? 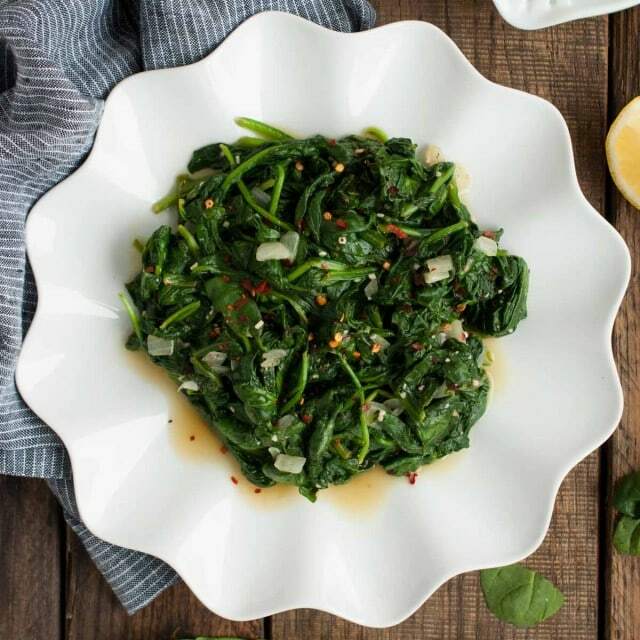 This quick and easy sautéed spinach recipe is a delicious low calorie side to any main dish and is ready in 15 minutes! Heat oil in large pot over medium heat. Add onion and sauté 2-3 minutes until onion starts to turn translucent. Add garlic and stir a minute longer until garlic is aromatic but not brown. Add spinach, salt, and pepper and stir to coat spinach in oil. Continue stirring every 30 seconds until spinach is wilted (about 4-5 mins). Do not continue cooking once spinach is done wilting - immediately remove from heat. Add lemon juice and red pepper flakes (if desired) and stir. Adjust saltiness if needed. Transfer to a serving dish with a slotted spoon to drain out the juices. That was soo delicious! Will be a new staple in our home for sure! Would this work with frozen spinach? I haven’t tried it but think it would probably work. It wouldn’t taste as fresh but would probably be okay! To quote the old Chicago ballad, “I’ve been searching so long, to find the answer…” to truly delicious cooked spinach, and lo and behold, I’ve finally found it! Praise be!!! The lemon juice makes all the difference!!! I still love spinach raw, but when it gets a little past its “spinach salad fresh” prime, I’ve got a viable, quick, easy, and delicious alternative! I would love to try this recipe but there are too many ads popping up between each sentence. It’s frustrating to attempt to follow. Do you have a print button in your recipes? Maybe I’m overlooking it? Update: I went out and back into the site and found the recipe with print button. No ads. Trying this for dinner tonight. Thank you so much for letting me know Chandra! My ad settings have been going a bit wonky lately and I’m trying to get it worked out. I’m glad it was better the second time you visited! This is SO good. I cannot believe the difference it makes to add lemon, garlic, onion and red pepper flakes. Yum. Now I love sautéed spinach. Thank you! Right? So simple but it comes together so well! I just made this tonight and it was amazing! So flavorful! I had to make a few changes in order to meet my nutritarian lifestyle but they were minimal (I replaced the oil with veggie broth and added 4 chopped mushroom caps to the mix). Thank you so much for sharing your recipe! Wuuh… i made it. Excellnt taste n good nutrition . Thanks lot.